Most people have heard of the physiotherapy profession in relation to the human medical and rehabilitation field, however many people still have not heard of, let alone had any experience of the veterinary physiotherapist. Human physiotherapy has been around for many decades (some may even argue centuries) as use of soft tissue mobilisation techniques, such as massage, and hydrotherapies have been around since the time of Hippocrates. 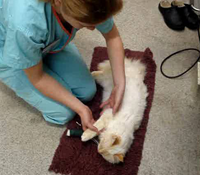 Veterinary Physiotherapy is a relatively newer profession, but has been around for over 30 years. Over the last couple of decades veterinary medicine and surgery has surged forwards with continuing advances in surgical techniques and medical knowledge. As a result, veterinary patients are undergoing more complex surgical procedures, surviving more severe medical conditions and generally living for longer. 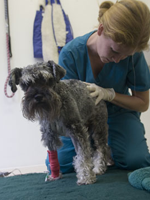 The aftercare and rehabilitation strategies therefore also need to advance to keep up with veterinary surgeons’ skills, and this is where the veterinary physiotherapist plays an essential role. 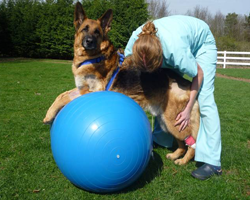 So what is physiotherapy exactly and how can it be used to help the veterinary patient? One definition is; ‘Physiotherapy uses physical approaches to promote, maintain and restore physical, psychological and social well-being’. This is the definition given for physiotherapy within the human medical world, however it still holds true and accurate for the veterinary patient. 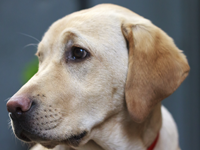 Following any sort of health issue, whether it is a medical condition, or intervention for an orthopaedic or neurological condition, many veterinary patients are significantly affected with regards to their function. Recumbency (this means lying down or resting) – whether or not it is because of an inability following severe medical illness, pain, or enforced by the surgeon following complex surgery – will certainly lead to muscle wasting and tightness in muscles and joints, if not other complications involving the cardiovascular, respiratory and psychological systems. The Veterinary Physiotherapist can utilise different hands-on skills with the aim to promote and speed up recovery to good independent function, maintain and prevent secondary preventable complications developing and essentially restore the veterinary patient to good functional status. What physiotherapy strategies can be used? Application of physiotherapy treated techniques in the veterinary patient requires an in depth understanding of the patient’s anatomy, physiology and movement patterning, as well as typical behaviours and communication strategies. With these key points of knowledge, the therapist should be able to apply an effective physiotherapy treatment regime in most domestic species. To help understanding of how physiotherapy can help veterinary patients, the following is an example of a patient who benefited from physiotherapeutic intervention. 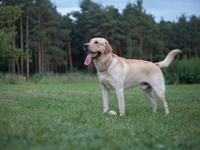 ‘Ben’ was a 7-year-old male Labrador. He had an extensive medical history, as well as orthopaedic issues, including bilateral cruciate disease (ie. problems with ligaments in both knee joints) which had been managed with surgery. Ben had become very subdued and quiet and was struggling with longer walks and going to the toilet, as well as not managing to walk on slippery floors around the home. He was referred for physiotherapy, and following an in depth assessment was found to have significant muscle wasting in both back legs, increases in size of and tension through the front leg muscles and muscles around his neck and shoulders, he had developed a way of walking which meant he was not using his hind legs well and therefore was getting weak in these muscles, as well as overuse of the front legs, (resulting in the previously mentioned issues) and finally stiffness of all of his joints. Physiotherapy involved managing both primary and secondary problems. Ben initially had regular sessions with the physiotherapist who used soft tissue techniques including, massage and myofascial release alongside the use of heat therapy, all of which were aimed at loosening up his muscles around his neck and shoulders, thus relieving tension and discomfort secondary to this. 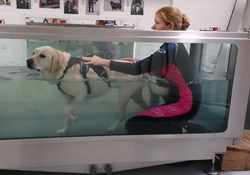 Ben also had sessions of pain management techniques, such as pulsating electromagnetic therapy, specifically over the back leg joints followed by controlled and facilitated movement patterning and exercise on land as well as regular hydrotherapy sessions in a water treadmill. The combinations of these techniques were aimed at making Ben as pain free as possible (as research tells us that pain and discomfort will prevent good muscle contraction) as well as re-educating Ben’s overall movement, and in doing so, strengthening previously disengaged and weakened hind leg and core muscle groups. Further to these contacts with the veterinary physiotherapist, Ben’s owner was taught a physiotherapy home treatment program to assist in his rehabilitation. She was also advised on managing his home-care so as to prevent Ben from injuring himself, creating sudden flare-up of on top of a long-standing condition. As Ben improved, demonstrated by managing longer walks, with a consist good overall movement pattern, and generally becoming a much happier ‘bouncy’ boy, he was weaned off his contact with his physiotherapist and his owner progressed his home program building him back up to normal function. Ben is now a happy interactive dog, managing long walks and lots of runs and his owner feels like he has become a puppy again – a very good outcome following physiotherapy. Helen’s first degree was a Bachelors in Equine Science at the University of Bristol and upon achieving a First Class honours, she undertook a Masters in Human Physiotherapy at Kings College London, completed in September 2004. Thereafter, she worked at Peterborough District Hospital, working with musculoskeletal, neurological and critical care patients. After the required two years’ experience in human physiotherapy, she undertook a Masters in Veterinary Physiotherapy at the Royal Veterinary College, completing this in 2009. Helen joined DWR in 2009 to develop a state of the art Physiotherapy Service. Working closely with all the Specialist Clinicians at the practice, Helen now offers a comprehensive range of land- and water-based physiotherapy techniques, as both an inpatient and outpatient service.